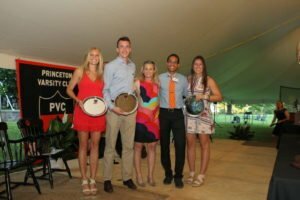 Princeton senior student-athletes and families, coaches and support staff and Tiger alumni convened on the Princeton Graduate College last Thursday, June 1st in honor of the 20th annual Gary Walters ’67 PVC Awards Banquet. 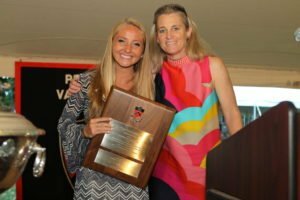 Several senior student-athletes and distinguished alumni were recognized throughout the evening, all while celebrating the Princeton Athletics Class of 2017. A complete photo gallery of the evening can be viewed here. 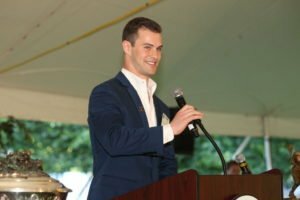 Sam Gravitte ’17, kicked off the evening with the senior student-athlete keynote address, discussing his experience as both a member of the men’s lacrosse team and his performances on stage in numerous Princeton productions. 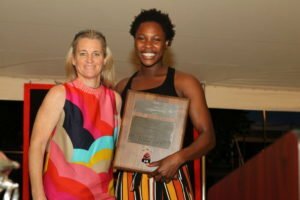 Ashleigh Johnson, one of the greatest athletes in Princeton history, is the 2017 winner of the C. Otto von Kienbusch Award as Princeton’s top senior female athlete. Johnson, who has twice been named the top women’s water polo player in the world, is one of two Princeton athletes ever to win an Olympic gold medal and then return to compete as a Tiger, along with Bill Bradley ’65. Johnson was the goalie on the United States team that won gold at last summer’s Rio Olympics. As Princeton’s goalie, Johnson finished her career with a 100-17 record, along with a school-record 1,362 saves and a .693 save percentage. She is a 19-time Collegiate Water Polo Association (CWPA) Defensive Player of the Week award winner, a four-time first-team all-conference player and the CWPA Player of the Year. Internationally, she allowed just 28 goals, made 51 saves and was named the tournament’s top goalkeeper in Rio. Johnson was also the first-ever African-American to make the U.S. national team. A finalist for the 2017 AAU Sullivan Award as the nation’s top amateur athlete, Johnson was also named an espnW IMPACT25 honoree for the Woman of the Year and the Swimming World Magazine’s Female Water Polo Player of the Year for the second straight season. She became the first water polo player to ever win the Women’s Sports Foundation SportsWoman of the Year award. Johnson is a psychology major from Miami, Florida. The other finalists for the von Kiensbusch Award were field hockey player Cat Caro, lacrosse player Ellie DeGarmo, fencer Katharine Holmes, lacrosse player Olivia Hompe, hockey player Kelsey Koelzer, soccer player Tyler Lussi, volleyball player Cara Mattaliano, track and field athlete Julia Ratcliffe and fencer Anna Van Brummen. 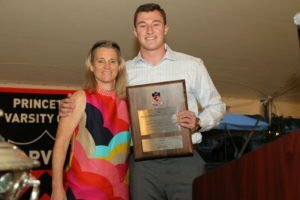 Spencer Weisz , the Ivy League Player of the Year and leader of the first Ivy League basketball team to go 16-0 in a season, is the 2017 William Winston Roper Trophy winner as Princeton’s outstanding senior male athlete. The first player in Princeton men’s basketball history to have 1,000 points, 500 rebounds, 300 assists and 200 3-pointers, Weisz was recognized as the 2017 Ivy Player of the Year, the 13th time a Princeton player has received the honor. His play helped lead Princeton to a 14-0 Ivy League season, the program’s first since 1998; a 19-game winning streak, the second-longest in program history; the first championship of the first-ever Ivy League tournament and within two points of fifth-seeded and 14th-ranked Notre Dame in the NCAA tournament. No player in program history has recorded a triple-double, but Weisz came close on a few occasions during his senior season. Against Saint Joseph’s, he had 10 points, 11 rebounds and eight assists, just two shy of the statistical milestone. Against Cal Poly, it was nine points, eight rebounds and seven assists. At Yale, he had nine points, seven rebounds and eight assists. Against Liberty, he tied a program record with 13 assists in a single game. Weisz ended his career as the program’s 12th-leading all-time scorer with 1,241 career points, fifth in 3-pointers made with 209, eighth in rebounds with 605, and second in assists with 383. The eighth player in Ivy League history to win both the Ivy League Rookie and Player of the Year honors during his career, Weisz, a history major from Florham Park, N.J., was a three-time All-Ivy League honoree, earning second-team recognition both as a sophomore and a junior. Weisz is a history major from Florham Park, N.J. The other finalists for the Roper Trophy were basketball player Steven Cook, lacrosse player Zach Currier, fencer Alexander House, hockey player Colton Phinney and football player Dorian Williams. There are five winners of the Art Lane Award for outstanding contribution to sport and society by an undergraduate student-athlete. Steven Cook, a two-year team captain and three-time All-Ivy League honoree, has left a lasting legacy of leadership and service during his time at Princeton. Steve has raised money for the Gidel Mother of Mercy Hospital in Sudan to help fund scholarships to support the training of additional medical personnel. Additionally, he has served as a business operations intern for the anti-poverty Heartland Alliance in his hometown of Chicago, helping to reorganize the group’s business operations systems at Heartland’s health clinic. In recognition of his service and contributions on the court, Cook was one of five Division I basketball players named to the Allstate NABC Good Works Team, where he was formally recognized at the 2017 NCAA Men’s Basketball Final Four. Cook is an economics major from Winnetka, Ill.
Olivia Hompe, a first-team All-America and Princeton women’s lacrosse all-time leading scorer, has epitomized our values of achieve, serve and lead both on the field and in her community. This two-year team captain has served on campus as an Arabic Language Peer Tutor, a Women’s Mentorship Program Pod Member, a member of the International Relations Council and a member of Princeton Students for Gender Equality. Additionally, Olivia has served as the President of the Varsity Student-Athlete Advisory Committee (VSAAC) and helped conceived and implement the “All Stripes, One Streak” campaign in support of diversity and inclusion in Princeton Athletics. For her many contributions, Olivia was one of 10 students selected to the Princeton University 2017 Scholars in the Nation’s Service Initiative (SINSI Graduate Fellowship). Hompe is a Woodrow Wilson School major from New Canaan, Conn.
Fiona McKenna served as an assistant captain for the women ice hockey team this past season, yet her impact as a leader extended well beyond the ice. Fiona has been an active member of the Varsity Student-Athlete Advisory Committee (VSAAC), and a frequent participant as part of several service initiatives under the Princeton Varsity Club, including Reading with the Tigers and Weapons of Mass Construction. Additionally, Fiona has organized an annual fundraising event wrapped around a home women’s ice hockey game, helping to raise funds for colon cancer, mental health awareness, and in support of former teammate Denna Laing who was paralyzed while playing professional hockey. During the summer of 2016, Fiona spent 8 weeks in Nepal teaching English in a government school as part of the WorldTeach Summer Program. McKenna is an economics major from Burr Ridge, Ill.
Alex Michael walked on to the men’s heavyweight rowing team as a 16-year old freshman and wasted little time in making an impact with his team and the greater community. During his freshman year, Alex started a Special Olympics rowing program in concert with the Special Olympics of New Jersey, the first of its kind. Four years later, there are now more than 100 Special Olympic rowers in New Jersey alone, and the model created by Alex is being implemented by the Special Olympics at numerous boathouses across the country. Additionally, Alex has helped integrate the Special Olympics efforts with the men’s heavyweight rowing program, including a terrific student-led event as part of the annual Crash-P’s indoor training session. Michael is an economics major from Nevada City, Calif.
Hailey Reeves, a three-time Ivy League champion and captain of this year’s Final Four field hockey team, has dedicated herself to service both on campus and abroad. Hailey has served as a Student-Athlete Wellness Leader and President of the Student Athlete Service Council (SASC), partnering with local school and organizations such as HomeFront, Community House and Habitat for Humanity to provide service opportunities for Princeton student-athletes across all varsity teams. During the summer of 2016, Hailey travelled to Rio de Janiero in Brazil, where she worked in a maternal and childcare hospital to study the clinical implications of the Zika virus and its impact on pregnant women. Reeves is an ecology and evolutionary biology major from Vancouver, B.C. Ashley Richards, an English major from Greenwich, Conn., is the winner of the Class of 1916 Cup as the senior letterwinner who has achieved the highest academic standing. Richards has been an example of perseverance over her four years with the women’s squash team. Besides achieving at the highest level in the classroom, Ashley continued to develop her squash game while adding depth to the team. Her progress was rewarded this past season, as she made her varsity debut a winning one in an early-season team victory at Jadwin.